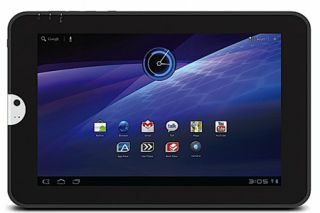 Toshiba Thrive tablet hits the UK from September 1st | What Hi-Fi? More tablet news, this time from Toshiba, which has announced that the 10.1in AT100 Android 3.1 tablet (aka the Thrive) will be available in the UK from September 1st. Powered by Nvidia’s 1Ghz Tegra 2 processor, the device offers up full-sized HDMI, USB and mini-USB ports as well as SD card compatibility. The plethora of connectivity options mean that files can be transferred directly to the device itself – a big bonus for those who yearn for more productivity out of their tablet devices. 16GB of built in storage should be enough to deal with the 2MP and 5MP snaps taken with the front- and rear-facing cameras, while a hefty 1GB of RAM should ensure things run smoothly. There's wi-fi as standard, plus Flash video support (unlike Apple), Toshiba Resolution+ image enhancement, a claimed seven hours' playback on a single charge plus access to Toshiba Places and Android Market. Options include the AT100 multi-dock which enables HD video playback via HDMI on large-screen TVs. No word on pricing as yet, but we’ll be sure to keep you updated as always.